Notes: Crude oil includes lease condensate. The sum of individual states may not equal total U.S. volumes due to independent rounding. A zero may indicate volume of less than 0.5 thousand barrels per day. Previous months' production volumes may have been revised for all states/areas. Percent change is calculated using unrounded values. Sources: Data for Arkansas, California, Colorado, Federal Offshore Gulf of Mexico, Kansas, Louisiana, Montana, New Mexico, North Dakota, Ohio, Oklahoma, Pennsylvania, Texas, Utah, West Virginia, and Wyoming are from the EIA-914 report. Data for states/areas not individually reported on the EIA-914 (Alabama, Alaska, Arizona, Federal Offshore Pacific, Florida, Idaho, Illinois, Indiana, Kentucky, Michigan, Mississippi, Missouri, Nebraska, Nevada, New York, South Dakota, Tennessee, and Virginia) are from EIA estimates published in the Petroleum Supply Annual and Petroleum Supply Monthly reports, based on crude oil production data from state government agencies and the U.S. Department of the Interior, Bureau of Safety and Environmental Enforcement (and predecessor agencies), and first purchase data reported on Form EIA-182, Domestic Crude Oil First Purchase Report. Notes: Natural gas production represents monthly natural gas gross withdrawals estimated from data collected on the EIA-914 report. Data for Arkansas, California, Colorado, Kansas, Louisiana, Montana, New Mexico, North Dakota, Ohio, Oklahoma, Pennsylvania, Texas, Utah, West Virginia, Wyoming, and Federal Offshore Gulf of Mexico are individually collected on the EIA-914 report. 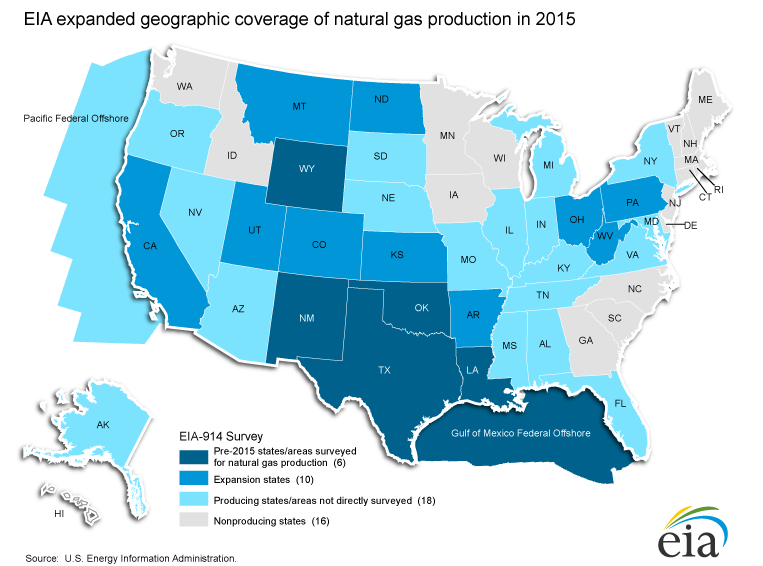 The "Other States" category comprises states/areas not individually collected on the EIA-914 report. Through 2017, "Other States" includes Alabama, Arizona, Florida, Idaho, Illinois, Indiana, Kentucky, Maryland, Michigan, Mississippi, Missouri, Nebraska, Nevada, New York, Oregon, South Dakota, Tennessee, and Virginia. Federal Offshore Pacific is included in California through 2017, and in "Other States" starting in 2018. Sources: Form EIA-914, Monthly Crude Oil and Lease Condensate, and Natural Gas Production Report and its predecessor, Monthly Natural Gas Production Report; BSEE reports; PointLogic Energy; BENTEK Energy; industry reports; and EIA computations.